Hercules and Flex, sounds like something from a muscle magazine. However, Hercules can make your Flex Radio more flexible. Ok, what the heck am I talking about. Let’s start at the beginning. The Hercules DJ Control MP3 E2 is a midi controller that is a hardware controller used with DJ mixing software. 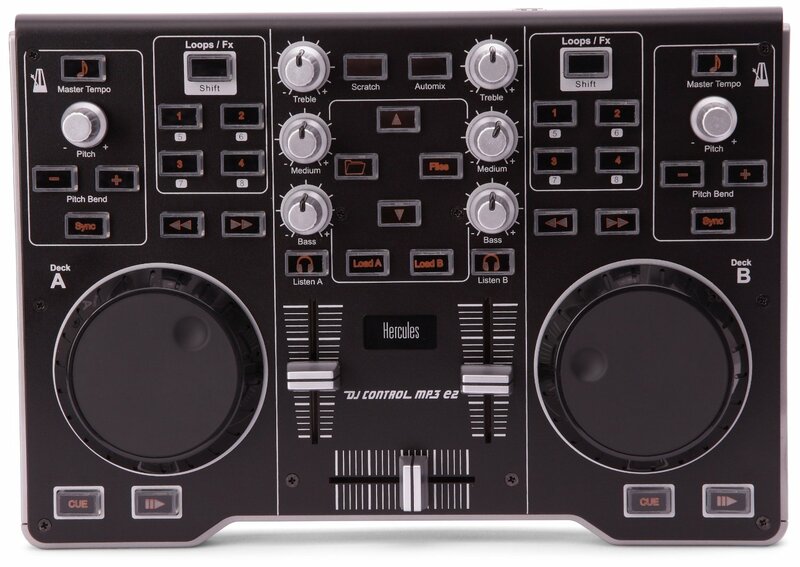 The controller is used to allow the DJ to have hands-on control of the mixing software through the controller. The Hercules DJ control is small and compact, but offers to large jog wheels, 6 fixed rotary controllers, 2 endless rotary controllers, 3 sliders, and 36 pushbuttons. Normally these controls are mapped to a DJ music program. Since the Hercules DJ Control MP3 E2 is an USB Midi device, other software that accepts Midi input can be mapped to use the controller. This is just what Tobias DH1TW has done with the Hercules controller and PowerSDR. Tobias has developed a “bridge” program that when combined with PowerSDR allows you to use the Hercules DJ Control MP3 E2 to control the various functions of PowerSDR. You can also customize the controller to your own personal tastes bu mapping the controllers’ knobs,sliders, and jog wheels to PowerSDR functions. In the end you wind up with a very powerful and flexible hands on controller for PowerSDR. The software can be downloaded at Tobias website. There is also a Yahoo Group that you may want to join for additional information. The Hercules DJ Control MP3 E2 seemed like a useful and inexpensive interface for my Flex 1500, so I decided to give it a try and ordered one for $79 from Amazon. Having dabbled a great deal in electronic music and owned several professional midi controllers, i wasn’t expecting much from a $79 controller. However, I was pleasantly surprised on receiving the Hercules DJ Control MP3 E2. It is actually pretty well made. The Hercules DJ Control MP3 E2 is fairly compact and doesn’t take up a lot of room on your desk. The best part are the two jog controllers that have a decent weight to them and work very smoothly. They even have a dimple to stick a finger in. They are not unlike jog wheels you would find on a radio. The buttons, knobs, and sliders all have a good feel to them. Six of the knobs have a center detent and the other two are endless rotary knobs that have click detents for feedback. Installing the Hercules DJ Control MP3 E2 for PowerSDR is pretty easy. First install the Hercules drivers. Then install the PowerSDR-UI software that you downloaded from the DH1TW website. You will simply need to unzip the software to your PowerSDR directory. To tell PowerSDR to use the controller, you will need to start the PowerSDR-UI.exe program first. The PowerSDR-UI program will then start PowerSDR for you. The controller won’t do anything until you go to PowerSDR and go to the setup menu. From there select General / User Interface. Then click on the User Interface tab and then the Select User Interface button. Make sure the Hercules DJ control is selected and click on Configure. This will bring up a virtual representation of the Hercules DJ Control MP3 E2. You will notice a drop down selection by each knob, button, or slider that lets you match it with a PowerSDR function.Be sure to click on Save when finished. You should now be ready to go! If you mapped the VFOA and VFOB to the jog wheels you should be able to use them as tuning controls. work.This allows you to close the PowerSDR program and use a 3rd party program like Ham Radio Deluxe to display tuning info for PSK-31 operations in DM780 or in the logging program. The Hercules DJ Control MP3 E2 combined with FXpad from Woodbox radio and a 7″ USB monitor like the MIMO UM-720S makes a killers setup for PowerSDR. I got the chance to use the Hercules DJ Control MP3 E2 / PowerSDR combination with my Flex 1500 on Field Day weekend an it worked great. I was able to use the jog wheels for VFOA and VFOB to quickly find and work stations. I would use the VFOA jog wheel to quickly locate a station to contact. While waiting to jump in, I would then use the VFOB jog wheel to tune in a second station. When I was ready to contact the VFOA station, I would use the volume slider mapped to VFOB to turn down the audio for VFOB. I had a button mapped for Vox to transmit. Once the VFOA contact was made, I would turn down the VFOA volume and raise the VFOB volume with it’s slider. This made it possible to hop back and forth between contacts without ever having to touch the mouse. It worked quickly and well. 1. It would be nice if the button backlighting could be toggled on and off for some functions. I realize that this may not be practical or easy to do, but it would be nice for the Mox button as a visual indicator you are in transmit. 2. It would be great if some enterprising soul would develop a laminated template that could be placed over the controller so you could easily label the buttons, sliders, and knobs. This could be a pre-labeled template or something you could write on. With so many, it can be a bit hard to remember what you set to control what. Some Hams use a label gun and stick on labels, but there has got to be an easier way. So, for a mere $79, you get a very useful controller for PowerSDR in the Hercules DJ Control MP3 E2. Many thanks to DH1TW for developing the user interface.